Native American Indians were a deeply spiritual people and they communicated their history, thoughts, ideas and dreams from generation to generation through Symbols and Signs such as the Panther symbol. The origin of the Panther symbol derives from the ancient Mississippian culture of the Mound Builders of North America and were major elements in the Southeastern Ceremonial Complex of American prehistory (S.E.C.C.). Some Indian tribes still retain some elements of the Mississippi culture. Their sacred rites, myths and symbols and are presumed to descend from the Mississippians. The Panther symbol featured strongly in the Mississippian culture. The Panther was believed to be a supernatural deity who resided in the Underworld with the spirits associated with death and destruction. The Panther is seen as a malevolent being or monster who fights then devours his enemies and was strongly associated with warfare. These creatures, or monsters, were referred to as "water panthers". As monsters of the Underworld they were locked in a never-ending war with the supernatural creatures of the sky (the Upperworld). Their battles were responsible for earthquakes, tornadoes and thunderstorms, they were Masters of the Rain which is why they are called "water panthers". 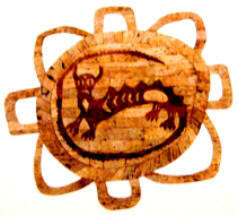 The panther symbol picture above shows these creatures with horns. Antlers and horns signified spiritual power, especially when applied to animals that did not ordinarily have them such as Birds, Panthers and Snakes (Serpents). The panther symbol also displays the creatures wearing the Eye Surround Motif which was a sign that they resided in the Under World. The panther symbol shows four panthers revolving around a central cross in a circle motif. The Cross in Circle Motif has solar connotations with the circle (the Upperworld) and the cross is believed to symbolize the sacred fire that exists in the Middle World (Earth). This could be interpreted as the water panthers circling the beings of Earth and the Upperworld waiting to attack. 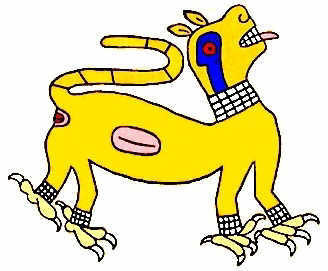 The Panther symbol also depicts this 'water monster' with the body parts of other animals. The tail is colored to reflect snake or serpent like similarities. The feet have the claws of a bird of prey. For additional information refer to Mythical Creatures. The Underwater panther is a powerful supernatural creature in the mythological traditions of some Native American tribes including the Algonquians, Ojibwe and the Potawatomi. The Ojibwe traditionally held them to be masters of all water creatures, including serpents. In these cultures the underwater panther is in opposition to the Thunderbird.